Use a blender or even food processor for this. You can use fresh or frozen Frozen mango here. Bear in mind that fresh mango will require less hemp milk. Chop your dates into small pieces (unless you have a really high powered blender, in which case, no need to chop). Add mango, frozen pineapple, shelled hemp seeds, chopped dates, cacao powder and plant-based milk and cinnamon powder to smoothie jug. 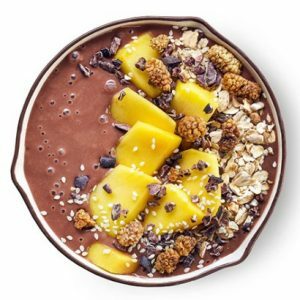 Pour into a glass, bowl or mug and garnish with coconut, mulberries, fresh mango, cacao nibs or nuts. This entry was posted in BLOG and tagged buzz feed, Mango, plantbased, recipe, smoothie, smoothie bowl, vegan. Bookmark the permalink.